The Samsung Galaxy Note 5 and the Galaxy S6 edge+ are undoubtedly the hottest topics in our rumor mill right now. The two eagerly anticipated phablets are keeping mobile fans on their toes and have been doing so for quite some time. But now, with Samsung's next Unpacked event approaches, leaks and information on the duo are becoming more and more substantial. Today brings us two complete specs sheets for the handsets in question. 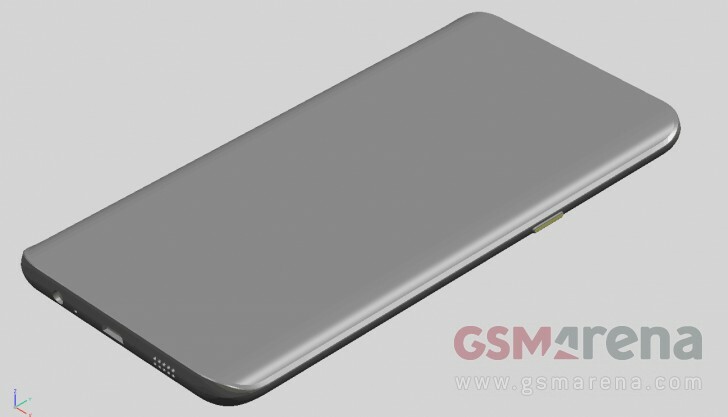 The Galaxy Note 5, also formerly known as SM-N9200 is the latest successor to Samsung's legendary phablet series will once again feature a 5.7-inch display with a resolution of 2560 x 1440 pixels and a pixel density of 515 ppi. 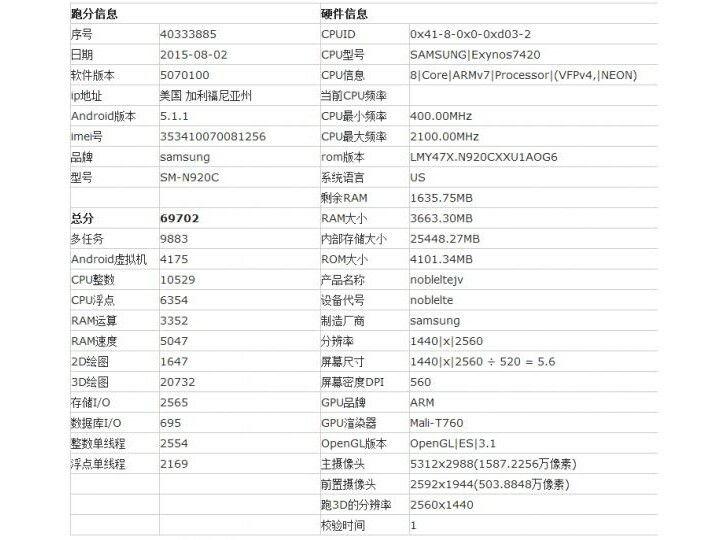 According to the leak, it will be powered by an Exynos 7420 SoC, the one found inside the current Galaxy S6 and S6 edge flagships. This is now the second source that references this hardware, instead of the Exynos 7422 model that was previously believed to power the Note 5. The rest of the specs include 4GB of fast LPDDR4 RAM, a Mali-T760 GPU and 32GB of internal storage, at least in the unit in question, other storage options will be available as well. The camera setup consists of a 16MP main shooter and a 5MP front-facing one. Sadly, there is no additional info on OIS, special color sensors of focus hardware or the flash. We got confirmation on the Android 5.1.1 version, though. Moving on to the Galaxy S6 edge plus (SM-G9280) - the beefed-up version of the S6 edge. 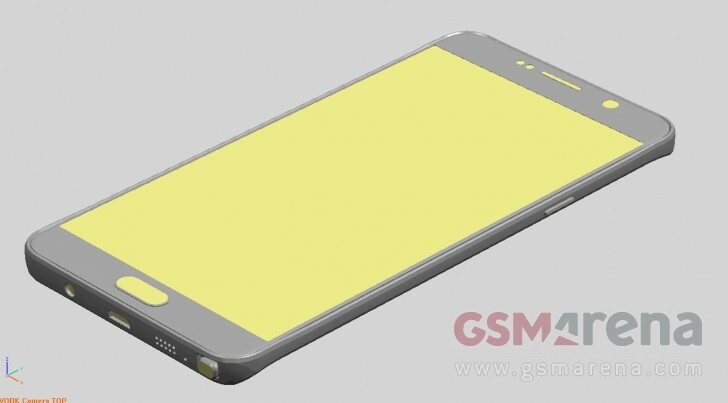 According to the leaked info it will be surprisingly similar to the Note 5, not counting the curved screen of course. The said display should be 5.5-icnhes with a 2K resolution and 534 ppi. The chipset is, again, Exynos 7420 and the rest of the hardware matches up as well - 4GB of RAM, Mali-T760 GPU, 16MP and 5MP cameras. Needless to say, both phones look quite promising and should deliver exceptional performance. 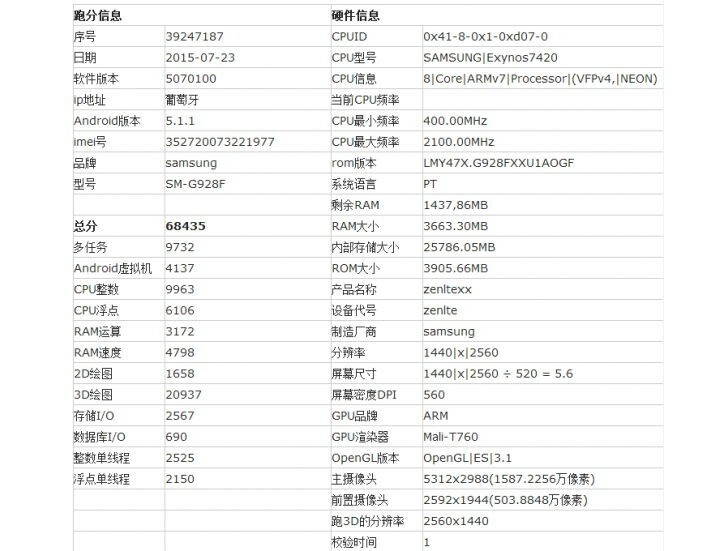 In fact, if leaked AnTuTu scores are to be believed, both the Note 5 and the S6 edge plus will manage to outperform the current Samsung flagship duo comfortably. The Note 5 has a top score of 69,702 and the S6 edge plus - 68,345, whereas the S6 and S6 edge managed to pull 67,520 and 63,910, respectively. There's no way to verify the credibility of these rumors, but given the amount of detail they give and the fact that most of it matches with other reports we are willing to give them the benefit of doubt. Either way, we will know the full story come August 13.
my S6 classic has 70k in antutu so soory gsmarena, but your data is out of date.